Ants just love sugary, sticky, sweet nectar! Whether it’s Hummingbird, Oriole or butterfly nectar, if they can get to it…you bet they will find it! But the good thing, and saving grace for those who feed nectar, is that ants can’t swim. They are virtually unable to cross a small body of water. Enter the invaluable ant moat. These little gadgets make the difference between great birding experiences vs. pesky, miserable ones filled with unwelcome guests. Simple by adding an ant moat to your hummingbird feeder, or other nectar feeders, you will stop ants dead in their tracks. The ant moat shown here is a little nicer than the standard model, but they all do the same thing…stop ants from getting at nectar. In the heat of summer, a drop of salad oil may be added to the water to slow the evaporation process. Remember, the ant moats will not work unless they are kept filled with water. Entice and encourage birds to nest in your yard with simple materials found around your home. Although there are all kinds of cool nesting material kits out there, you can do this one yourself… easily! Start with a suet cage or even a mesh produce bag, like the kind apples come in at the grocery store. Next time you empty the lint basket in your clothes dryer, nix that soft, fluffy material as it’s just not natural. Got a cat or dog? Pet hair is keeper. If you brush your pet, save the hair that accumulates in their brush. But steer clear if Fido or Fluffy has been treated with flea & tick meds. If you happen to have a horse… even better! 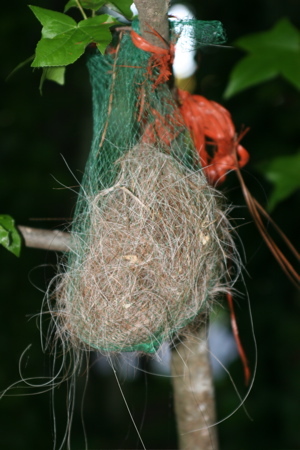 The nesting material shown here is horse hair. Mostly from the mane and tail, it makes for great stuff to help bind the birds’ gatherings into a nest. Ever work with silk or dried flowers? The decorative moss, especially Spanish or sphagnum moss is wonderful. Stuff a little moss into the nesting ball too, but keep strands short. They even like bits of raffia and especially feathers. Hang your nest ball from a branch in a visible spot for birds to easily see it. Somewhere in the proximity of existing bird feeders or birdhouses is best. Don’t pack the materials too tightly as a generous air flow dries them quicker after rain. Simple materials from around your home, that are usually discarded, make for great nesting materials to help birds thrive and flourish in your backyard. You can entice birds to stick around, without adding more feeders and houses, but by offering valuable nesting material for them to help raise their families. Don’t forget the shallow fresh water too! Washington, DC (May 28, 2010) – Interior Secretary Ken Salazar’s pick to bring “reform” to the much-criticized Minerals and Mining Service, Bob Abbey, has for the last 18 months earned a reputation for business as usual and coziness with industry in managing public lands as head of the Bureau of Land Management, In Defense of Animals charged today. “Abbey’s appointment is a slap in the face to the victims in the Gulf Coast and all Americans concerned about proper and unbiased management of our public lands,” said IDA Research Director Eric Kleiman. Kleiman called Abbey’s 18-month tenure of leading the BLM under Secretary Salazar a “textbook example” of coziness with industry – exactly the same problems at MMS that must be reformed. He said that the Department of Interior regularly issues industry-biased Environmental Assessments that result in the removal of thousands of wild horses. Kleiman charged that Salazar and Abbey have blatantly mismanaged the BLM’s Wild Horse and Burro Program, continuing Bush Administration policies that have cost tens of millions of tax dollars annually by removing tens of thousands of iconic wild horses from public lands for the benefit of private livestock ranchers and other exploitive commercial industries. Today, there are more wild horses warehoused in costly long-term holding facilities than remain in the wild. And one of Wyoming’s last desert wildlands, Adobe Town — 200,000 acres of canyons, badlands and wilderness-quality lands — is just one of the latest targets of the Abbey-managed BLM for destructive oil and gas development. The backyard and wonderful wildlife habitat is under attack from the worst spell of starlings right now. They eat EVERYTHING in site and bully the songbirds. The mess they leave is not nice either. Starlings are non-native birds, I wish they’d go back from where they came! It is the thistle feeder and hummingbird feeders that are safe, that’s it. Of about 15 assorted feeders, the nyjer bird feeder is the only seed feeder they’ll leave alone. Three hummingbird feeders are starling-free as well. They just about empty the birdbaths everyday too with their splashing around. I even witnessed one trying to stuff himself inside the bluebird feeder, reaching for worms and grabbing a few with his body half in and half out of the feeder! Thistle or nyjer seed is wonderful with its many benefits. Squirrels don’t like it either, and tend to leave feeders alone. This seed is non-germinating and won’t cause weeds to pop up below the feeder. And I’m not just ranting because of them in my yard, these birds wreak havoc with air traffic control towers and the airline industry, causing thousands of dollars (if not more) in damages every year. They’re even responsible for a few plane crashes. Although nesting season may be winding down for some wild bird species, others are just gearing up. The bluebirds in our yard are on their second brood for the season. American Goldfinches breeding season is just starting and runs through late July. You can attract and encourage birds to nest in your yard by offering different nesting materials. There’s a bevy of easy ways to do it, and several great products to use. The Birdie Bell shown here, is a versatile holder for bird nesting materials. 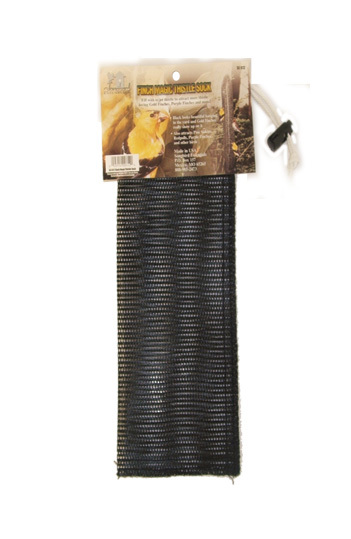 The beauty with this item is that it can be utilized year round for birds. Shaped to hold birdseed bells in winter time, it conveniently holds orange halves in summer to attract Orioles and others. Spring, summer and winter, this product offers birds seasonal treats to help them thrive and flourish. The Hummer Helper Nest Kit is the perfect material for hummingbirds, another species to breed and nest through summer months. Offering these bird nesting materials is even likely to bring more hummers to your feeders. Juveniles born in proximity to feeders will be visiting along with mama, and since hummingbirds practice “site fidelity” they’re likely to return the following year if conditions are favorable. Hummer Helper has even been endorsed by The Hummingbird Society. The bird nester is a large wooden-back, cage like holder for bird nesting materials. It contains a special blend of natural fibers that are perfect for feathered friends to build proper nests. Refills are available for this, and most nesting material holders too. Birdhouses and feeders aren’t the only way to entice and encourage sweet songbirds in your yard. You can help them thrive by offering a variety of nesting materials. And as always, a fresh water source will attract even more feathered friends…guaranteed! When the simple joys of backyard birding become thwarted….it means that it’s time to do something. Simple solutions do exist for some of the most common problems associated with backyard birding. Wild bird accessories were created for convenience, and to attract more birds. There’s tons of gadgets and gizmos out there, but the basic ones are tried and true. Seed catchers for example, will eliminate ground mess. Tired of weeds popping up in the garden? With a seed tray, or seed catcher the problem is eliminated. 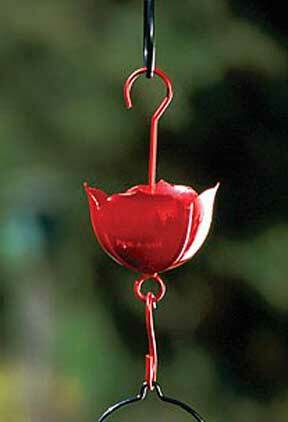 Available in several designs, seed catchers may be attached to hanging or post-mount bird feeders. The larger ones even serve as additional feeding space for birds who may not perch at a feeder. So you’ll never know who might visit? Window Alert Decals are literally life savers for many birds. These decals are barely noticeable to humans, but act as a shield to guard birds from striking windows. After several stunned or dead birds on the back deck, I quickly realized these were a “must”. Also, if there’s a territorial male cardinal fighting with himself at your window…Cardinal Alerts will solve the problem. Bird accessories like those mentioned here, really do make a difference in the everyday life of a backyard birder. You may not think any of this stuff is necessary, until you’ve tried them! PS: If anyone knows how to get rid of the pain in the a$$ starlings in my yard right now, please let me know! They’re eating everything in sight, bullying the songbirds, and making a serious poop mess. Much thanks to that guy who brought them here from Europe! Because American Goldfinches have such a sweet disposition, they’d rather just give up and fly away than compete at nyjer feeders. With their breeding season just about to start, you can bet feeders will be crowded soon. Fledglings pretty much eat nyjer exclusively, so parents will be chowing down! Adding a few thistle socks will help keep up with demand at this busy time of year. These nyjer feeders are inexpensive and very convenient when compared to most feeders, and some improvements have even been made to this old favorite. The black thistle sock shown here has a stronger mesh which gives the feeder longer life. The draw cord at top keeps seed and feeder more secure. The cool thing is the black color because Goldfinches vibrant lemon yellow plumage gives a great contrast against the black sock. They really do to show up better – for a better bird watching experience. The thistle socks are available in several weight capacities, they really do make for great nyjer feeders! Traditionally, nyjer or thistle seed has preyty much been confined to the tube feeder…but it doesn’t have to be. Nowhere is it written in stone that nyjer bird feeders must be tubular in design! And here’s one I don’t really understand: caged nyjer feeders. Not many larger birds enjoy thistle seed. Right now there’s a spell (brief I can only hope) of the peskiest starlings in my yard and they don’t go near the nyjer bird feeder. Squirrels don’t like either, and that’s one of the beauties of feeding this non-germinating seed. The stained glass and copper bird feeder shown here holds approximately 5 pounds of nyjer seed, which is a generous capacity. And unlike tube feeders, there’s never any clumping, damp seed at the bottom to be tossed and wasted. This feeder is hand made and absolutely gorgeous! The wooden Songbird Lanterns are stylish Nyjer Bird Feeders with modern architectural appeal. The attached pine cone even serves as an extra treat when suet is added to it. Ditch the tubes if you’re looking for something truly unique, with quality that will last for years. Nyjer Bird Feeders make wonderful gifts for any backyard birder or nature enthusiast…for any occasion! A gift to be used daily, that gives back to nature, and is enjoyed by birds and their hosts alike. 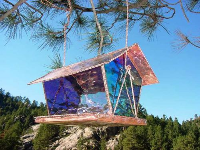 Never any worries of re-gifting with a high quality bird feeder! Some of the new backyard birding products are great, and some…well, not so great. This Finch Bird Feeder by BirdsChoice is definitely one of the great ones! A new design for feeding thistle (or nyjer seed) has arrived. 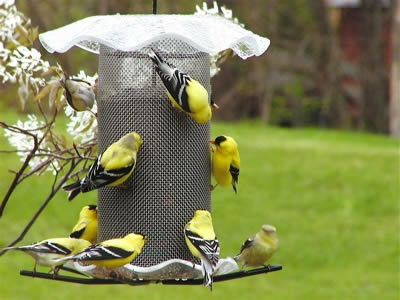 A patented material called magnet mesh attracts more birds to cling to the feeder. Unlike other finch feeders in the traditional tube style, this one allows for “all-over” perching for more birds to feed at once. With it’s recycled bright yellow frame, the rectangular shape allows for even seed distribution. The difference being no seed clumping at the bottom to become moldy and wasted. 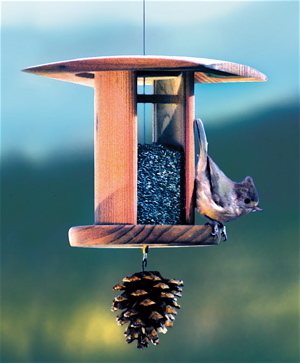 Constructed of durable poly lumber, and polyester powder coated black screen, this unique finch bird feeder comes with a lifetime guarantee. 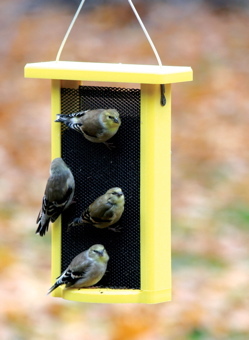 The smaller version shown here holds 1.5-quarts of thistle seed, while the large feeder has a 3-quart capacity. When Goldfinches’ colors fade in late fall, it’s best to leave feeders out year-round for them. They’re still around, sans the vibrant plumage. Leaving your finch feeders out year round pretty much guarantees that fantastic vibrant summer plumage. Since Goldfinches are also one of the last birds to breed, hanging nesting material in your yard will entice them to stick around. Unlike hummingbird or fruit feeders for migratory and some songbirds, finch bird feeders are a welcome addition to any garden or yard virtually year-round. You’ll be graced with the most gorgeous lemon yellow plumage in warmer months, only because Goldfinches are one of the few birds experiencing two molts per year. They’ve even earned the nickname “wild canary”. These colorful birds flock to finch bird feeders and chow down on thistle! In fact, they eat it almost exclusively and nestlings are fed the same. This food has added benefits; squirrels ignore it, and it is non-germinating which means that spilled food won’t turn into weeds. Some of the longer tube feeders can cause problems with clumping, damp food at the bottom. If your feeder is not busy enough to have finches eat all of the thistle, (also called nyjer seed) on a regular basis, it can clump when it gets damp, molds and turns rancid. Then the attraction for our feathered friends will quickly fade. A feeder that distributes seed more evenly is one solution to this problem. The Finches Favorite 3-Tube feeder is a perfect example of this practice. Plus you can see all 24 birds eating at once, which is a truly spectacular site! You can also try working with your existing feeder to alleviate this problem, Something I have tried is buying a few inexpensive ping pong balls and putting them inside my finch feeder. The thistle is fine, so it flows around the ping pong balls and is available to the birds. But the balls take up space in the feeder, reducing the amount of food it holds. The result: less food in the feeder means less clumping and fresher food. You can add or remove balls until you get the right balance of food and space for your feeder and your habitat.